When the weather changes from cold to hot, you see changes not only in what people wear, but also what they eat. Since Korea has a very humid and intense summer it’s not surprising to find icy desserts and drinks everywhere. But how about icy cold noodles? One of my favorite dishes all year round is naengmyeon, or North Korean-style cold noodles. Naengmyeon is traditionally winter food because back when there was no refrigerator it was difficult to eat cold food when it wasn’t cold outside. But now you can enjoy naengmyeon anytime of the year. 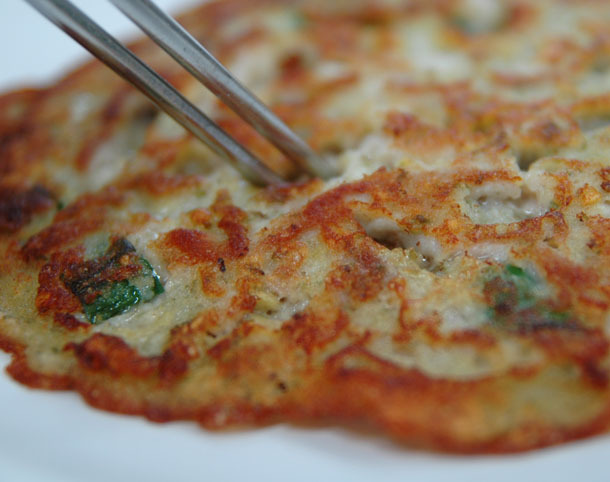 Originally from North Korea, there are two kinds of naengmyeons in South Korea: Hamheung and Pyeongyang. The names come from North Korean cities they’re from. Hamheung naengmyeon mixes chewy potato starch noodles and spicy chili pepper paste without broth and Pyeongyang naengmyeon has thicker, brittle buckwheat noodles in mild cold broth. My personal preference is Pyeongyang naengmyeon because of its mild flavor, which gets surprisingly addictive once you get used to it. 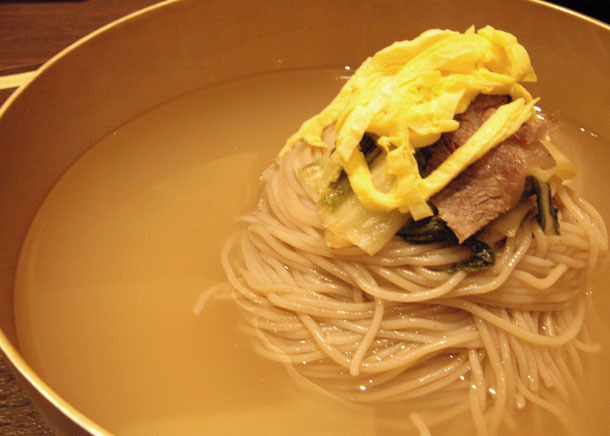 To many non-Koreans the concept of eating noodles in cold broth is strange and unappetizing. Many I’ve made try said they just “don’t get” the appeal. I don’t blame them because it has bland taste. Nevertheless it doesn’t stop people from getting obsessed with this dish. 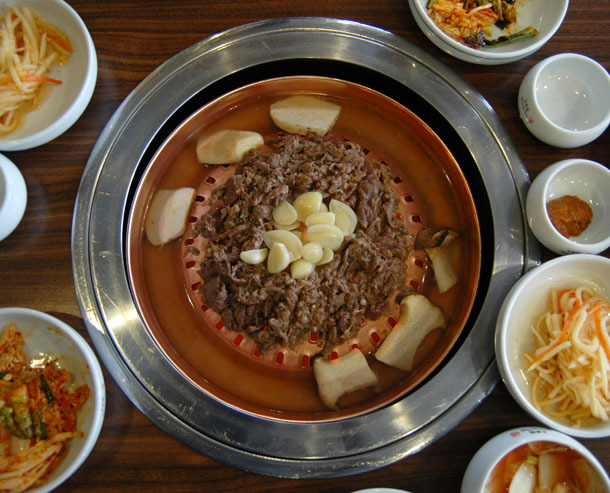 Korean food is mainly known for its strong garlic and pepper flavor and sizzling hot temperature. But naengmyeon is the opposite of all that; it’s refreshing and that’s what makes you feel good. 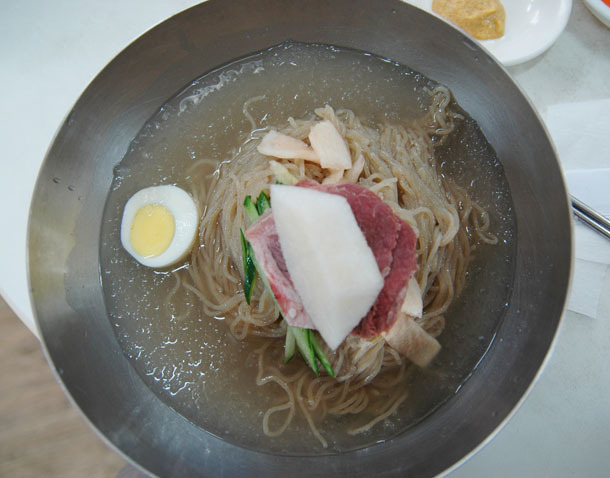 Naengmyeon is actually very difficult to make and has complicated taste despite how simple it looks. 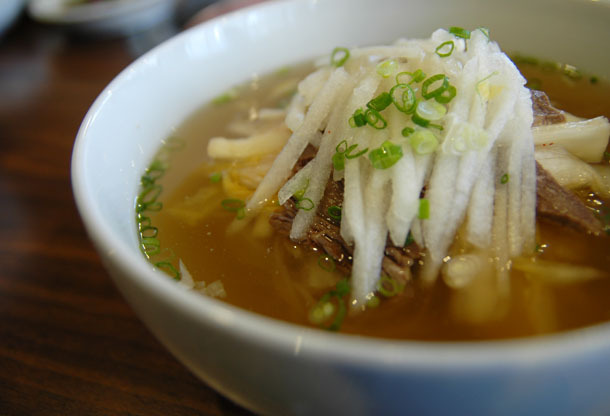 The broth is a delicate combination of beef and pheasant (mostly just beef these days) and dongchimi, or water kimchi. When it’s done well the broth just has a hint of beefy flavor without overwhelming and leaves refreshingly tangy aftertaste in your mouth. And you can add a hint of vinegar and mustard for more depth of flavor. There are three places in Seoul that I’d like to recommend for Pyeongyang naengmyeon. Mostly these are old restaurants because the art of mastering naengmyeon is quite hard and serious naengmyeon maniacs have high standards. Eulmildae, a rundown 42-year-old restaurant in an old neighborhood, is often considered a good place to start if you’re new to Pyeongyang naengmyeon because their naengmyeon has smoother noodles and more flavorful broth than other traditional places. Eat a steaming hot nokdujeon (mung bean pancake with pork) and soju with your naengmyeon after a long day and there’s no other place you’d rather be. Woo Lae Oak serves perhaps one of the most authentic Pyeongyang naengmyeons you can find in Seoul. 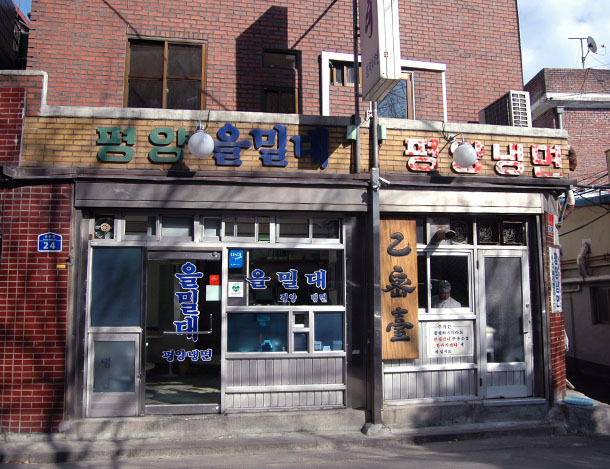 Now with branches in Washington, D.C. and Chicago, the Jang family from North Korea opened their first restaurant in Seoul in 1946. Woo Lae Oak doesn’t use dongchimi in their broth. Instead, they use a combination of beef and pork stock. This results a subtler, less tangy flavor. Often you will see displaced people from the North visiting this place to taste nostalgic food that they have left in the North. Woo Lae Oak’s another specialty is bulgogi. Without being too sweet or salty, their bulgogi has just the right amount of flavor. 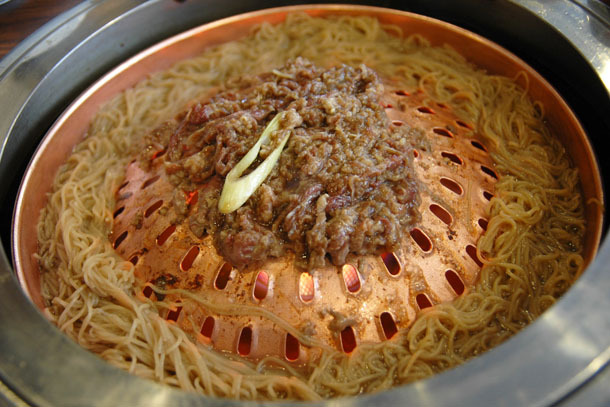 My personal favorite is adding naengmyeon noodles to bulgogi, which tastes… amazing. Bongpiyang has many branches around the city. 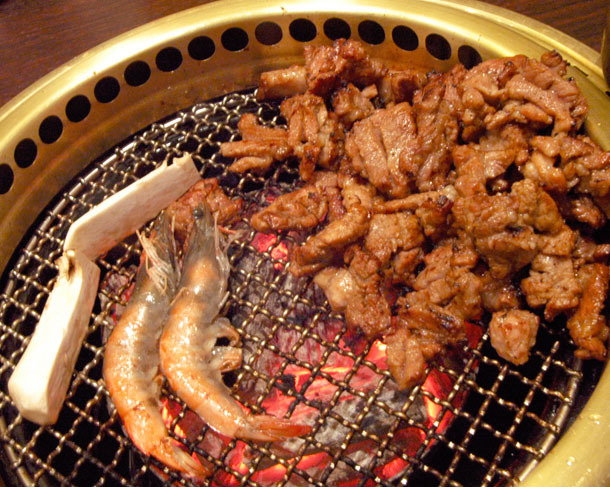 It’s a casual brand of the famous Byeokjae Galbi, which is known for serving high quality galbi (barbecue ribs). But since some people came just to eat naengmyeon, they started a brand where they specialize in naengmyeon. The taste is quite authentic and delicate. To go with their naengmyeon, they have beautiful pork galbi, which just melts in your mouth. Try a piece of barbecued pork galbi with your cold noodles. You will be pleased. This entry was posted in Seoul, Taste and tagged cold noodles, Korea, naengmyeon, north korea, Seoul. Yumyumyum!!! This is enough to make me want to hop on a plane and fly over there for the weekend! My god, you have a way with writing about food (and taking photos of it) that makes me want to eat every single thing you recommend. Haha, Cindy, you like me too much! Thanks! !